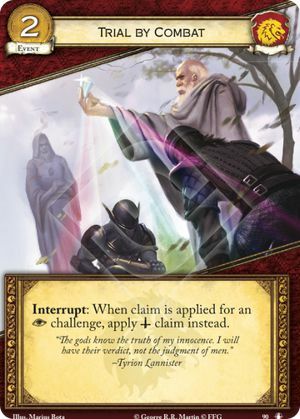 Interrupt: When claim is applied for an challenge, apply claim instead. From RRG pg 18: A replacement effect is an effect (usually an interrupt) that replaces the resolution of a triggering condition with a different means of resolving that same triggering condition, but in such a manner that the triggering condition is still considered to occur. The word 'instead' is frequently indicative of such an effect. After all interrupts to the triggering condition have resolved and it is time to resolve the triggering condition itself, the replacement effect resolves instead. If multiple replacement effects are initiated against the same triggering condition, the most recent replacement effect is the one used. Claim replacement effects are used during the C step of DUCK (after Determining the winner and gaining the Unopposed bonus, right before Claim is applied). These effects do not resolve immediately, rather they modify the way claim will be applied after all interrupts are played. Trial by Combat can be used in combination with the Maester of Whispers title in Melee, because Master of Whispers is NOT a claim replacement. Rather, it is more of a claim modifier - like an effect that raises or lowers the claim number on a player's plot. Effectively, any claim effect that resolves "by player" can be modified to apply to whichever players the attacking player wants (instead of the normal scheme of "only the defending player").